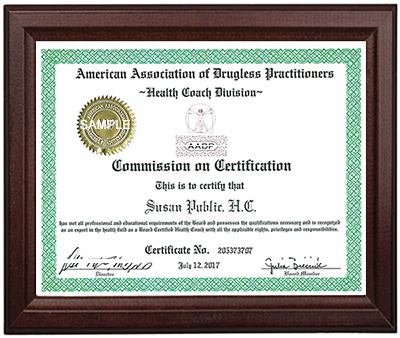 The AADP‘s new division recognizes being a Health Coach as a separate professional health modality. We offer practitioners holding a Health Coach degree or certificate full Board Certification, including many professional “real world” benefits to assist them and their practice. This is a professional liability policy that covers consulting and educating and runs approximately $138 per year for a 1 million dollar policy. Client Questionnaires, Disclosure forms, Office forms, etc. All members will be automatically added to a list which will be used to refer practitioners to the general public. Your webpage can be added to the AADP Resource Link Page per your request. This is a verification of your education and expertise as a Health Coach. Many of our members print Board Certified by the AADP on the bottom of their business card. So Join Today to advance your career and be recognized as an expert in the health field as a Board Certified Health Coach.